OSHA recognition certificate for participating in 2016 National Safety Stand-Down to Prevent Falls in Construction. Design Telecommunications own Ryan Shock is selected to participate on the Telecommunications Tower Technician Task Force in Dallas. 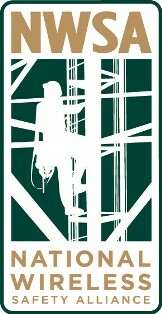 Design Telecommunications is now a ” Warriors 4 Wireless” Partner W4W Tower Installation Training. Warriors4Wireless (W4W) is a non-profit formed to bridge the gap between the demand for trained and deployable wireless technicians and the thousands of qualified servicemen and women eager to transfer the skills they’ve learned in the military to civilian careers. Registered participants will be challenged physically during this intensive technical training program and should be prepared for climbing exercises while carrying specialized tools used to perform tower installation tasks. Upon successful completion and graduation students are eligible for the Tower Apprentice Program supported by industry hiring partners and prepared for long term careers in the Wireless Industry.